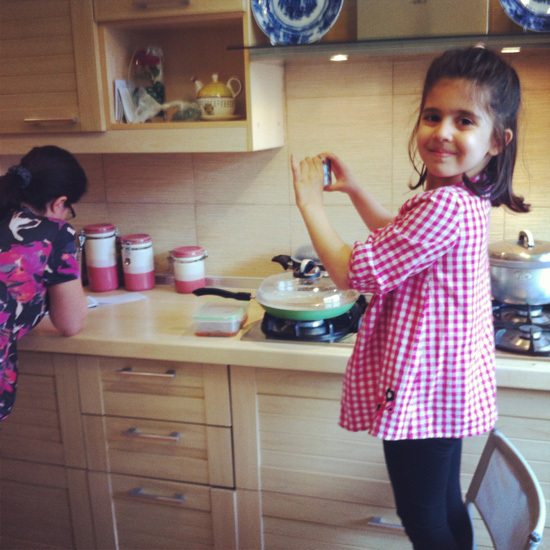 Here’s an adorable little Persian girl who lives in Tehran, Iran. I have a treasure trove of pictures and stories to share from my recent epic trip to Iran and while I’ve been remiss in diligently posting those, I’m getting the wheels spinning by starting this series of “Iranian People” — where I’ll share pictures of the everyday average ordinary Iranians that I hung out with, met, befriended, or otherwise engaged with during my trip. Just ordinary Iranians, doing ordinary things. Such as, for example: laughing, smiling, or otherwise displaying a glimmer of a sense of humor! Ah: those tricky tricky Persians! I tell ya! I can’t help but smile every time I look at this cover photograph. I love this little girl so much! Her name is Arezoo and she is smart, funny, cute, brainy, girly-girly to the max, opinionated, charming, fierce and sweet; and she’s part of a family that’s dear and close to mine and I got to finally meet her when I was in Tehran during my Iranian Odyssey. One time, my friends Haleh and Laila (Arezoo’s auntie and mommy, respectively) picked me up, took me to their home (after we’d first gone for an early morning hike and breakfast up in the mountains with their entire family, but that’s another story altogether) and they cooked up a storm — making some of their specialties, so that I could photograph it and share the recipes with you. A few times, yours truly got up on a chair to take overhead shots of the food (which as many of you know, is par for course in food blogging territory.) Mimicking my actions, Arezoo also got up on a chair and started taking photos – proving that sometimes, imitation IS the sincerest form of flattery. I was charmed! Haleh managed to make hijab look effortlessly chic. Exhibit A! This is my friend Haleh, and here are two pix I snapped of her when we met up one sunny spring day at the Seyhoun Art Gallery in Tehran — where I was interviewing the owner of the gallery. 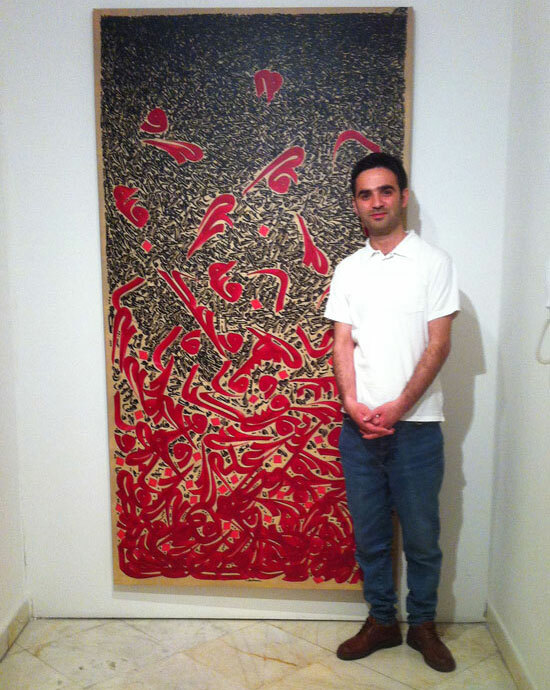 (At the time, Seyhoun gallery had Reza Afasari‘s solo “Sealed Letters to Myself” painting exhibition.) Afterwards, Haleh took me to the House of the Artists (an art hub in the middle of a beautiful Persian garden) where we checked out lots of artwork; had a very nice lunch where I tried a tamarind drink for the first and probably last time in my life, and we almost went to see a rooftop staging of a play as well but left that for another day. Later on, Haleh and I also ended up taking a short memorable trip to Yazd together that was a blast. Getting a chance to finally see and hang out with this lovely childhood friend was one of the immense pleasures and rewards of this trip. Mind you, I’m touching lightly on all these various topics (Iranian artists, the interview, art galleries in Tehran, trip to Yazd, rekindled friendships, etc.) but definitely hope to write at length about each. Before moving on to the next photo, please do observe how my friend’s scarf is perfectly kept in place. Seemingly held by invisible fairies? The women in Iran had techniques — defying the laws of physics and gravity and slipperiness — which enabled them to wear their headscarf just so and have it remain in place. Meanwhile, yours truly had to fuss and muss and ineptly do and re-do my scarf’s knot or else pull it forward as it slipped at every opportune and inopportune moment. 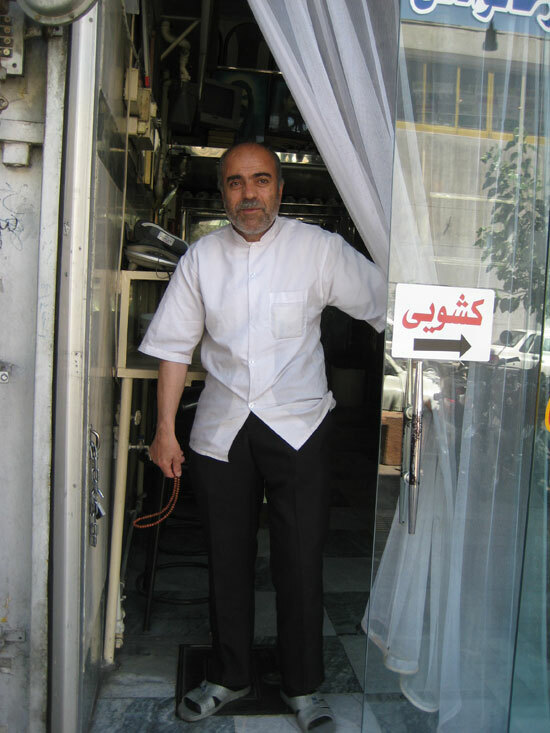 Now I have a few more stories and pix from my Iranian odyssey coming up in just a bit and right below, but first, I’m going to go on a tangent and get on a soap box. TLDR? (No, no, please stay and do read!) 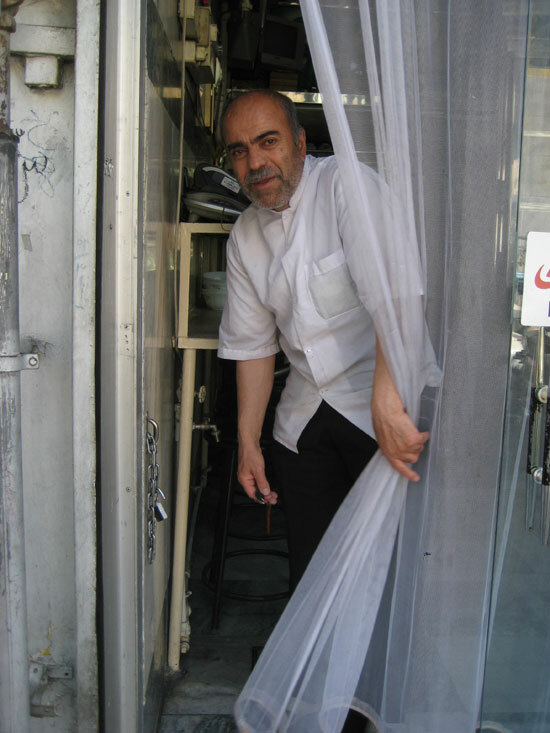 Here, have some yummy Persian food served by this poised and friendly Iranian chef at a popular self-service restaurant in Tehran to fortify you while I take a teeny tiny detour and rant a bit. Even though I go on and on around here chirping about the beauty and glory of the Persian food and culture and people like a naively oblivious Disney cartoon character, I’m keenly aware that for an awful lot of folks their mental image of Iran and Iranians comes from the mass media and if so, they probably harbor extremely negative ideas about the country and its people. Aside from a desire to preserve my lovely mom’s recipes, the main reason I started this blog and have had the motivation to merrily chug along is an attempt to do my bit in helping balance a frustratingly tilted perception that at best is myopic, and at worst, is dangerously unfair to a culture that is ancient and remains a rich and beautiful one and to a people that are friendly, hospitable, and nice (just ask Anthony Bourdain!) thus leading to (excuse my language) ignorant yet sadly prevalent prejudice. Ignorance such as some people even actually wondering: Do Iranians have a sense of humor? Do Iranians laugh? Dinner Party Download: Turning to Iran and the way it’s perceived by people, Westerners, me included, we typically hear very little about Iran. What do you find about Iran that people are surprised by? 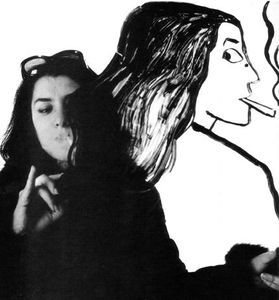 Marjan Satrapi: In a book tour an old lady who read one of my books came up to me and said: ‘oh, you know, I’m no longer scared of the Iranian people,’ and I said “how come?” and she said: “because I didn’t know that you could laugh that you had any sense of humor.” … You know, they’ve made it that we are these people that … when we’re talking about Iran it’s either beard, veil, or it’s nuclear weapon. And that reduces us to abstract notions and we stop being human being and if you’re not a human being then of course you don’t laugh and of course you don’t fall in love and of course you don’t like to eat ice cream and … which is dangerous because from the second that people become abstract notions then they are not human beings anymore and we can go and bomb them so I don’t try to change the world with my film but if they can say this country that you are so scared of is the same country a man died because of the love of a woman I think that I’ve done what I had to do …. I don’t want more than that. So, this is a photo of the artist Rasoul Akbarlou posing in front on one of his beautiful calligraphy artworks – at the opening reception of his exhibit at Mah Art Gallery where he graciously allowed me to take his picture. This photo does not do justice to his artwork, which I was not alone in my group in finding stunningly beautiful. 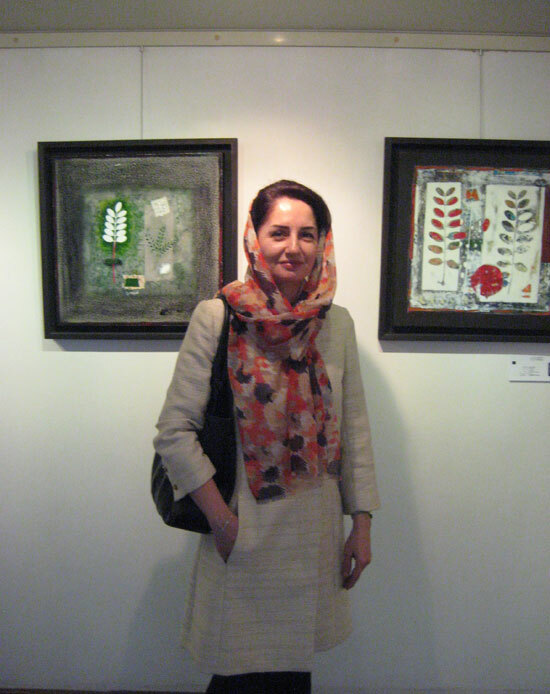 There are lots of art galleries in Tehran and every other Friday, many have their “eftetahi” – that is art opening receptions. Some Tehroonies have a fun ritual of making the rounds of these art opening shindigs: for the art, for the social factor, and for the free yummies served. Oooh, the pix and tales I have and plan to share with you – including the interesting story of how and in whose company I ended up in this gallery! 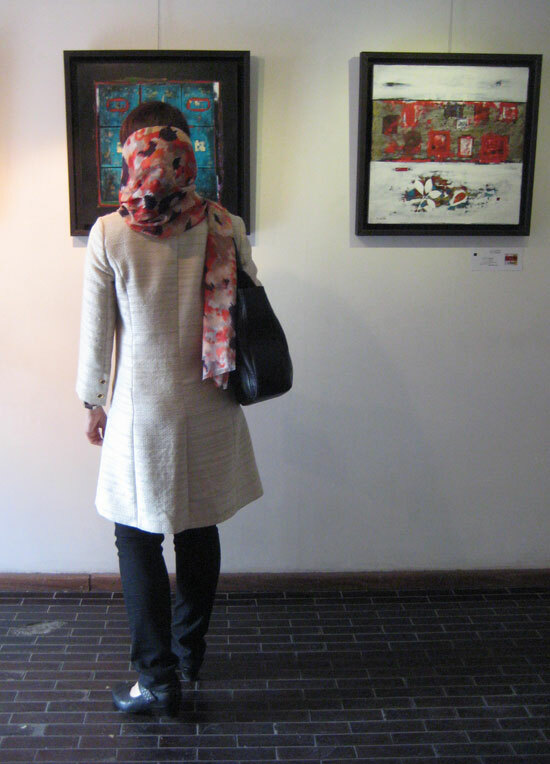 Meanwhile, borrow two legs (remember that Persian proverb) and run and go read this wonderful article about the art scene in Tehran, by the editor of Reorient Online Magazine. So one day a friend and I headed all the way to a far-flung neighborhood on a rather intriguing fact-finding mission that ultimately led to a heartbreaking discovery. In contrast to the rather depressing conclusion, the neighborhood itself was quite lively and interesting and I was loathe to leave and would have loved to explore its nooks and crannies but my friend and I had to go to another far-flung corner of Tehran. 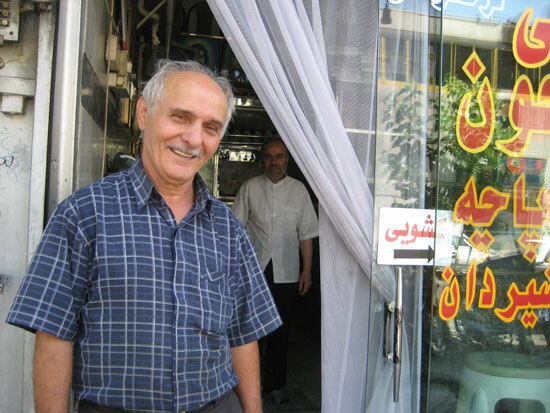 Just before we were to get into a cab, I noticed this kaleh pacheh food establishment and the very friendly owner and his assistant and asked if I could their picture. They readily and gamely agreed with enthusiasm. Let’s face it: they were hams! I believe we may have all indulged in a fit of giggles as well, as though we were experiencing something hilarious! It was a fun moment in time. 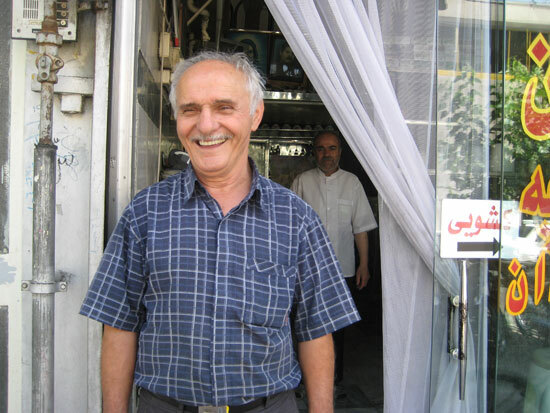 And with that, doostaneh khob, lovely people, thus concludes the first part of this series – my travel pictorial of “Iranian People” — which I hope helps answer questions such as: who the heck are these Eyeraynians and do they even know how to crack a smile? Answer: Some do! Boos Boos & Have a lovely weekend! ssshhh … we have to break the whole khaleh pacheh very gently to the uninitiated 😉 & thank you for the thumbs up! & look forward to: zaboon. one of my faves! Love the photo’s Azita, was hoping you would start posting them. I love seeing the smiling faces, you captured their personalities in your photo’s, they are alive. Really beautiful and I can’t wait to see more. Wow what great stories and what an amazing resource. I love your pics and it’s so cute how the little girl imitates you. She’s adorable. What beautiful art! I love pics of cooks and chefs too. It’s cute because they’re used to being behind the scenes. I can feel through your post your bursting desire to share with the world the love you have for your country and its amazing people. Very well written. I love your insight about the cooks’ eagerness to be photographed! I can totally see that. Delighted that you enjoyed this dear Amanda, and keenly appreciate your complimentary and lovely comment. Azita you are a clever gladiator for enlightenment, using your camera and wit to disarm the ignorant. Don’t apologize for the time it has taken for you to gather and organize your chariot of treasures. You are back! I thoroughly enjoyed this post. Thanks. So glad to hear it, dear Natasha! Beautiful, thank you so much for sharing this Azita jan. As an Iranian-American who hasn’t yet been able to go to Iran, i treasure this! what a lovely and exciting series! Real and, at the same time, wonderful people and stories. Our personal window on the Persian world. What’s not to love? Thank you so much! So excited to read this post. 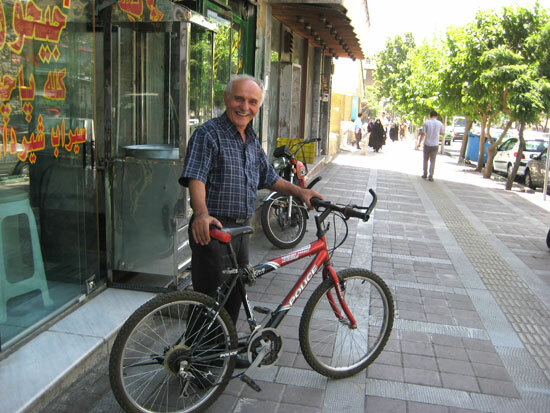 Its sad that some don’t see that Iranians don’t smile and laugh. A lot of people are afraid of the unknown. It’s writers like you that open our eyes. Your visit has allowed us the reader to hitch a lift and get a small glimpse of what real life is like. Which is a rare treat. I love sitting at my desk and being able to be see the real Iran. So happy to hear it,dear Sophie!